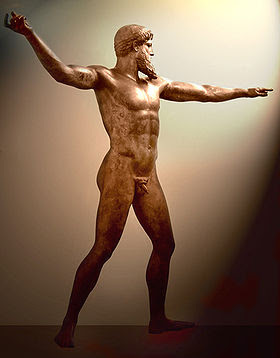 Bettany Hughes contemplates the Ancient Greek Bronze Paris, seen here reaching for The Apple That Started a War. I recently watched a clip of the brilliant but sometimes flowery Classicist Dr. Nigel Spivey talking about Greek Sculpture which was posted at the wonderful Challenging The Past blog. This clip is taken from the interesting 2005 BBC/PBS series, How Art Made The World. The clip can be viewed below. More info on this great series can be viewed at the PBS website. As much as I loved How Art Made The World I always felt like it spent a lot of time in melodramatic reflection rather than imparting facts. Whilst some of the Ancient Greek Masters were undoubtedly prodigiously talented Sculptors, particularly those that produced marble originals, there is a missing query in this narration that should be added for the sake of completeness. Relatively recent scholarship and experimentation has been - quite unpopularly - looking at modes of emulating realism used in the ancient bronzes, such as the famous Artemision Bronzes. One of these notions is that many of the prolific amount of Bronzes from this era were life casts, or based on life casts - allowing the sculptor to first make a wax cast from life, modify the forms seen and then use this waxen model to make a shell from which a bronze would be cast. Whilst many would offer no argument when stating this was how many Roman bronze and cement plaster copies were made of the Greek originals, stating that casting may also have been employed in making originals seems to get some unnecessarily upset. Whatever the mode of creation may have been, the beauty of the The Artemision Bronzes inspire artists to this day - seen most notably in the framing of the famous aristeia sequence in Zack Snyder's film 300(2006). An aristeia is a convention of Classical Greek Poetry, seen most notably in The Iliad and The Odyssey, and later by the Roman Poet Virgil in The Aeneid, working in Latin, but still adhering to the dactylic hexameter of Homer. This type of sequence is used to display the Hero's great prowess in battle. 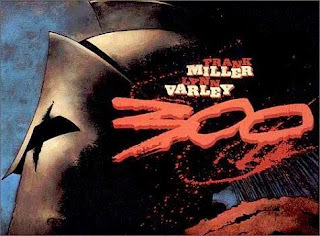 Whilst some classicists and history-philes lament that 300 is not an authentic presentation, they somehow seem to lay aside the Homeric precedent which Zack Snyder's team of actors and digital artisans so artfully employed in bringing Frank Miller/Lynn Varley's 1995 Graphic Novel to life ... Yes! The film 300 was always intended to be a rendition of a comic book, not a history documentary! Going back to the bronzes, it is sometimes difficult to divorce the emotional ties people have to the advent of realism in sculpture, but I personally am in favour of work that anyone can do to unravel the practicalities of ancient artisans as opposed to speaking about it purely in aggrandising yet uninformative manner. Just like Vermeer's alleged use of a camera obscura, or his known use of a pinned piece of string to mark perspective lines, insight into the techniques use to create amazing artworks is a valid inquiry that should be divorced from emotional response. Historian Bettany Hughes touched on it in part 2 of her amazing 2007 documentary Athens: The Dawn of Democracy. A clip can be viewed below. My advice is two watch the two clips, and rather than firmly make your own mind up - because there is no definitive record of ancient techniques - simply be aware of the possibilities that contributed to the realism seen in some of the famous bronzes of antiquity. Nb. this video may not be accessible in the UK. I agree with you about Spivey and "How Art Made the World." There are some good ideas that are presented in his series, but a lot of time is unnecessarily spent on melodrama. I also feel like Spivey jumps to a lot of conclusions in this series - I think he's trying to be simplistic enough for a wide audience (which I understand), but his arguments end up sounding a little too generalized and unsupported. Thank goodness M! I was hoping I wasn't the only one that was frustrated by Spivey's melodramatic nature. There's enough in that clip to make it palatable in a short dose, but trying to watch his whole series in one hit as I did will make you yell unnatural things at the TV! What a fascinating post! The live casting makes sense but how do they reconcile the exaggerations of the so-called perfect bodies in the first video with live casting? However, I think the point about the weight-bearing toes makes a a strong case for it! The life cast was used to make a model - which then could be embellished or altered. They then cast a shell from the altered model to (eventually) get the bronze final. This is of course to take nothing away from the truly talented sculptors who could hew marble, if anything it makes us appreciate them more. The casting methods was moreso a technique geared toward speedier production, copying and embellishment.